Close your eyes and drift. 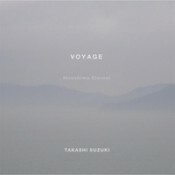 That’s all you need to do to enjoy Takahashi Suzuki’s lush ambient/spacemusic work, Voyage – Hiroshima Eternal. Between the long, so-gentle pads and light touches of classic analog sequencing, this sonic tale of a spirit’s journey after that day in Hiroshima coasts along with endless grace and beauty. It’s as moving as it is relaxing, and gains a lot of strength from a well-considered simplicity. For the most part, the pieces on Voyage rely on a familiar, not-too-involved rise-and-fall of chords, letting harmonies work their magic rather than heavily layering sounds. Upon my first listen, I almost felt like the sound was a bit thin. In the repeated listens that followed, I understood that here, less is more; that Suzuki’s melodies, pulled out to a slow-motion dance, don’t need a lot of embellishment or augmentation. There is precisely as much here as there needs to be for the music to work, to be felt as well as heard, and Suzuki relies on a lot of subtlety in his compositions. I especially like how he weaves the analog lines into “Knowing to Return.” Having given us long stretches of smooth quietness, the sequencer sounds more vibrant, its texture more pronounced. It bring us back around before the final track. And, again, it’s subtle. It doesn’t barge in, it just insinuates itself into the flow like it’s always been there. It works in perfect concert with the pads around it. Voyage, it should be said, is a very familiar ride; Suzuki stays well within the confines of this brand of music. It’s the strength of the emotional core that pulls it above the ordinary. It’s touching and personal. I’d say it’s almost impossible to go through a softly soaring piece like “The Knowing,” with its angel-choir pads and almost elegiac string tones, and not have a deep memory, similar in feel. rise to the surface. That’s what makes Voyage the excellent disc it is.